Block Grant Railroad at Full Speed! Could the House reconsider SB 7? This question has been the talk of the past weekend. So by way of explanation, we thought we should clarify the rules and possibilities. First, to call for a reconsideration, the person making the motion has to have voted on the prevailing side. In this case, only a legislator who voted YES on the bill could make a motion to reconsider. Such motions need to come within 24 hours. Again, in this case, the motion could have been made today since the legislature was not in session Saturday or Sunday. Rep. Sue Boldra (R-Hays) switched her vote at the last minute on Friday becoming the 64th YES vote. She did this in the hope of being able to make a motion to reconsider later. This leaves some folks wondering why she did not make the motion today. The Senate stayed in session past the House on Friday for the sole purpose of reading SB 7 into the Senate that night. Once the Senate had possession of the bill – after it was read in – the chances for a successful reconsideration on the House side drop. If Boldra had made the motion and was successful in securing 63 votes to reconsider, the Senate would have been asked to return the bill to the House – a request they do not have to honor. The chances they would send the bill back were very slim. Additionally, it should be noted that four legislators who voted against the bill on Friday and would have voted to reconsider were excused absences today due to family medical emergencies. This would have made it nearly impossible to pass a motion to reconsider. There is no reason to doubt Rep. Boldra’s motivations or sincerity. She made the vote switch after House leadership had secured 63 votes. Rep. Peck was flying back on the Governor’s plane and would have voted YES had he arrived in time. The only real reason for Boldra to switch was to ensure someone was available to call for a reconsideration. With the bill in the possession of the Senate, a vote to concur was scheduled for 3:30 this afternoon. The House Appropriations Committee had cleverly put the block grant bill into a Senate bill. This means the bill would not go through the normal Senate Committee process. Senate Bill 7 had been passed by the Senate earlier and sent to the House Appropriations Committee. Instead of acting on SB 7 as sent over, the Committee gutted the bill and put the block grant bill into it. SB 7 became House Substitute for SB 7 and the Senate can now have a vote to concur or non-concur in the House changes to SB 7. A bill in this form cannot be amended – only voted up or down. As we post this, the Senate is debating a motion to concur in the changes to SB 7. This will likely be a long debate. If the bill passes the Senate, then it goes to the Governor for his consideration. We will give you the voting record for the Senate tomorrow when it becomes available. This bill is exactly what the Governor called for in his State of the State address last January. On Friday, the Court was quick to respond to the House action passing SB 7. In light of the passage of SB 7, the Court called for additional defendants in the case, specifically the State Director of Accounts and Reports, the Revisor of Statutes, the Secretary of State, and the State Treasury. The Court also noted that they will not hesitate to block the state from enacting the change so they can assure the availability of relief for the Plaintiffs. Further, be advised that upon motion of the Plaintiffs or the State or upon the Court’s own motion, with or without notice, the Court may agree or elect to impose such temporary orders to protect the status quo and to assure the availability of relief, if any, that might be accorded should the Court deem relief warranted. [C]ounsel for the Plaintiffs are directed to join and serve as additional Defendants the Kansas Director of Accounts and Reports, the Kansas Revisor of Statutes, the Kansas Secretary of State, and the Kansas State Treasurer as contingently necessary parties forthwith. Rep. Mario Goico (R-Wichita) invited freshman legislators to a special briefing on school finance over the lunch hour today. I’m sure you are imagining the experts in school finance – people like Deputy Commissioner Dale Dennis or Brad Neuenswander – who have been working with the formula for years. But you would be wrong. The “expert” brought in was none other than Dave Trabert, anti-public education lobbyist and voucher/privatization advocate. TAKE ACTION NOW! Block grant bill up for final action tomorrow morning! Block Grant Bill advances to final action! Final vote at 8:00 tomorrow morning! Here are key points to make in your contact with these reps. Please think carefully about the block grant school finance bill. Remember that the current formula is not broken, it is simply underfunded. The current formula was put together very deliberately and designed rationally to meet identified needs in education – needs like bilingual or at-risk students, transportation, and school district size. I am worried about a plan to throw out the formula for a temporary fix while waiting for a new formula to be written. If a new formula is needed, please do not repeal the current one before writing the new one. Those who work in education understand how the formula works. Please let us go on with our day to day work while you make decisions going forward. It was clear today, that this bill DOES NOT appropriate ANY money for schools. A vote for this bill guarantees NOTHING. Time is very tight as the House convenes at 8:00 am tomorrow. In addition to the above legislators, please contact your own Representatives. 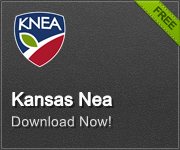 Click the button below to access the KNEA legislative portal. Click here to send a message to your legislator!